Fond of Snape » Blog Archive » chocolate, cauliflower, pecans, viggo, a movie and vampires! chocolate, cauliflower, pecans, viggo, a movie and vampires! Friday night was the chocolate party; we had chocolate fondue with pound cake, strawberries, bananas, pineapples & rice krispie squares with cocoa nibs & Heath bar crunch bits; chocolate pizza (Nutella on pizza dough with grated bits of dark chocolate); and piece of Hershey’s new “Bliss” chocolate…yum! We followed that up with some regular pizza and a rousing games of Apples to Apples. Afterwards, Michelle and I went to see Baby Mama. Eh. It was ok…I did enjoy the doorman, though, he was hysterical! Today…I did some shopping, changed our home phone service, and took Wolf for a walk. That’s about it! Caught up on my Tivo’d shows (Lost is just getting waaaaay too confusing, but I can’t stop watching it, and I’m glad that Moonlight is back, and that Mick is back to being a vampire) and cooked dinner (roasted chicken, since it was chilly out, grilled asparagus and mashed potatoes. It’s Autumn in Australia; Spring in the US and it makes for a lovely combination! Usually, Julie’s would be on the right and mine on the left, but we liked the U shape and left well enough alone! You can see more of our work here. I just love your collaberation work. I wish I could find someone to do that with. Awesome idea. I’m glad you finally did that shoot. The chocolate party sounds fun!! Love the shots this week. How was the chocolate pizza? That sounds interesting! Hi Janet! Michele sent me! Great outtake from the photo shoot. Well done! And your treat sounds fabulous! We too saw “Baby Mama” and I had the exact same reaction. The movie was just…”meh” but the doorman was great. I just wanted Amy Poehler to be so much funnier! Anyway, Michele says hi! Have a great day! Excuse me while I go rifle through the cupboards for chocolate! I just love popping over for the photos. And to get me thinking about chocolate. sorry. i got stalled by the mention of a chocolate party. I’m sorry… what did you say? I couldn’t get past the chocolate fondue. Mmmm… fondue. The outtake looks fun. Mm, chocolate and pecans, proof of god or goodness in the universe. 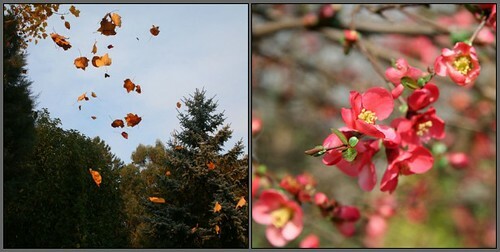 Love love love the Autumn & Spring photos. *Perfect*. =) They just made me so happy! A chocolate party….YUM!!! SOunds like a busy weekend! I had one of those too! Come look at my pics! Cam looked at that picture and asked if it was taken back when he was still in my tummy… when i told him it was from this weekend he told me i was fat. nice. can’t wait to see the rest of the nut pictures! I love Spring in New England…the three hours we usually have of it before it gets hot! Chocolate Party sounds fantastic but peacans were the next best thing. I agree the movie was meh “ok” at best, but the company was great! Wow, can you come get some stuff done at my house? I have been awake since Saturday night- flew the red eye last night. Today is Monday, right? I love your collaboration. Fall and Spring look beautiful together. One can never have enough chocolate. I LOVE Nutella, have to try and make the pizza. And that chocolate party…. can I just say yum? Glad you had a good weekend! I love your collaboration this week. Such a nice contrast.